Are you ready for some serious sparkle? Well Tonic Nuvo Glimmer Paste has it! I have to warn you that this is a lengthy post because once I started playing the with the Glimmer Paste, I found so many cool ways to use it. So grab a snack (or pin this for later) and let's get sparkly! You might be wondering, what is Tonic Nuvo Glimmer Paste? It is a dimensional paste bursting with sparkly glitter. You can use it on many surfaces, like paper, acetate, wood and more. It is currently available in 12 colors, 6 with opaque glitter and 6 with transparent glitter. You can add water to paint with it and the transparent colors are easy to tint with dye reinkers. The transparent colors are also effected by the color beneath them (see the cardstock samples below). And let's talk about 5 fun ways to use glimmer paste! #1. Apply paste direct to paper. Use a palette knife, clean fingers or any tool to apply paste directly to cardstock. For this card, I applied Moonstone paste to the right side of my stamped panel. Then I pressed a piece of bubble wrap into the wet paste to create texture like abstract "bubbles" or sea foam. #2. Apply through a stencil. Use a palette knife to apply paste through a stencil. I used Moonstone & Blue Topaz to create an ombre look. Using tape to create a "hinge" for the stencil makes it much easier to remove from the cardstock. And make sure to wash the stencils while the paste is wet. 3. Apply through a DIY mask. Die cut or hand cut a mask from your favorite medium (I love Inkadinkado Stamping Mask Paper). I die cut a circle from the mask paper and applied the negative piece to white cardstock. I blended Distress Ink in the circle and applied Moonstone Glimmer Paste over top. Using a mask instead of a stencil gives a less dimensional surface, almost like glitter paper. Apply a generous amount of paste and press sequins, beads & die cuts into the paste while it is still wet. #5. Create a "squishy" card. Use plastic to create a pocket with one open side. Scoop a small amount of glimmer paste into the pocket and a little water (I added 3 sprays from my Nuvo Mist Bottle). Carefully mix water in by kneading pocket but don't push paste out of the open edge. Add sequins or glitter and seal with fuse tool. I sandwiched a glimmer paste pocket with seashell sequins between 2 pieces of cardstock with a negative circle opening, to create a "porthole". Then I stamped inside the card so when you "squish" the pocket around, you can see the sentiment. Thanks for stopping by! I hope you are excited about Tonic Nuvo Glimmer Paste! I'm off to add it to something else! Hi everyone! I'm so glad you stopped by for Satur-YAY! We are celebrating the weekend by getting our craft on. There's no better way to spend your weekend. Am I right? Today I'm going to be making a few Mothers Day cards using Tonic Nuvo Embellishment Mousse and some stamps and dies from Lawn Fawn. I thought it would be fun to create my own custom color of Nuvo Mousse. I used the Mother of Pear and Aquamarine colors to create a beautiful, aqua minty green color. This mousse has a beautiful pearlescent sheen to it and dries instantly on your cardstock when applied with a cloth, your finger or a brush. You can cover an entire piece of card stock to create your own custom pearly card stock, or just use it on a portion of your card stock like I did. I'll show you how I created my own custom color in the video tutorial below. I'll also give you a few different ways to apply the Nuvo Mousse to your project to create different looks, including a shimmery watercolor effect. All of these different methods of application will give you a slightly different look. Be sure to check out the video tutorial below. I'll walk you through all of that. I'm using Lawn Fawn's Fab Flowers and Happy, Happy, Happy stamp and die sets. These fun and funky flowers make stamp layering easy. And the Happy, Happy, Happy stamp set has a greeting for almost any occasion. I finished the cards off with a frame die cut from real wood paper and a little shine with the Sparkling Clear Confetti Mix from Pretty Pink Posh. Thanks for stopping by today. I hope you've enjoyed these projects and I hope I've inspired you to get in your craft room and create something this weekend! If you do, I'd love to see what you create. 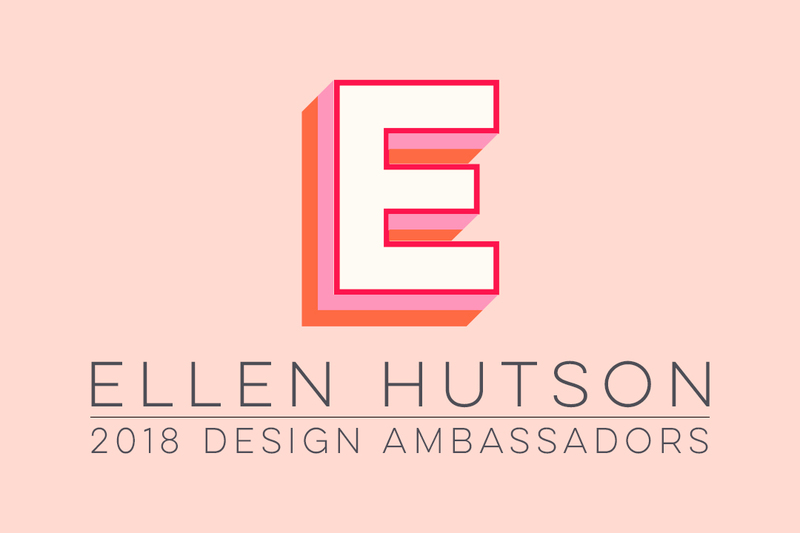 Share it on Instagram using #EllenHutsonSaturYAY so I can check it out. Until next time, happy crafting and I hope you have a fabulous day! You can watch this video in HD on our YouTube channel by clicking HERE. Don't forget to subscribe while you're there so you don't miss any of our fabulous crafty tutorials. Happy Friday, crafters! Are you enjoying Mousse week here in the CLASSroom as much as I am? I never knew there were so many fun and pretty uses for mousses! Today I am sharing how mousse can come to the rescue in your papercrafting projects. My card has a stamped acetate tag on it, colored on the back with Tonic Mousse, over an embossed cardstock background. Using the mousse as is, directly from the jar, it is beautifully opaque which is what I wanted for my acetate tag, so the the embossed background would not show through the flowers. But I discovered the mousse can also be thinned with water, and I have some samples at the end of this post. Adheres to just about anything! Obviously, it is ideal for use with stencils. As a comparison to stencil paste, Tonic's Embellishment Mousse is a little lighter and fluffier. Adds a unique lustrous shine to any papercrafting project. It has just the right amount of beautiful pearlescent metallic shimmer, provided by highly pigmented mica powder. Used straight from the jar, it is provides an opaque textured coverage. Apply with a soft cloth for a smoother finish. Add water to soften the consistency. 4. Customize the color of Craft-a-Board. To make my card, I started by hand cutting a piece of acetate to a #8 tag size (just use a #8 manila tag as a guide). Then I stamped it with Essentials by Ellen Mondo Peony using Jet Black Archival ink. The sentiment is from Mondo Hydrangea. I used my Misti since acetate can be tricky to stamp on, in case I needed to stamp again. Fortunately, my first inking was good! Originally I thought I would try coloring the flowers two different tones, to create some shading. So in my palette I mixed Pink Flambe Tonic Embellishment Mousse with Mother of Pearl, to create a lighter shade of pink. The mousse mixed together very well, creating a new lighter color! So I would highly recommend either getting light and dark shades of one color family so the two can be mixed together to get a mid-tone color, or getting the Pearl or Black Ash so you can lighten or dark any color! Unfortunately, I didn't care for the shading I attempted but since I was working on acetate, it was easy to wipe/scrape off and start over! (Although I missed a few lighter specs of pink, so you may see that showing through on my sample). I used a cheap old paint brush to apply the mousse to the back side of my stamped acetate tag. You can apply it as thick or thin as you'd like. I ended up applying it thick, for a very opaque look. I found the easiest way to "paint" it on with a brush is to mix it up a little first (use a cotton swab or palette knife). By working it and loosening it up a bit, it is easier to apply with the brush. I later discovered the mousse can be thinned with water, to make it easier to apply, giving a slightly less opaque finish AND it dries lovely on the acetate (a sample is shown at the bottom of this post). Had I simply read the jar, it tells you that water can be added to the mousse to create a softer, smoother application, LOL! I used Aquamarine mousse directly from the jar to color white silk ribbon, making it match the rest of my card and tag perfectly! To finish my card, I embossed a Taylored Expressions Cupcake cardstock panel (4" x 5.50")with TE's Leafy Vine Embossing Folder. The panel was adhered to a 110 Lb. Neenah Solar White card base onto which I also rubbed the Aquamarine mousse down the left side (about 1/2-inch). The mouse applies to cardstock easily and did not cause warping of the heavier 110 Lb! This is a great way to also color coordinate paper to the rest of the elements on your project. The tag was trimmed to 5.50" and popped up with foam tape (behind the peonies) over the card base, but you could also use temporary adhesive so the tag can be removed and used by the recipient. As I said above, after I finished my project I had the idea to try mixing a little water with the mousse to create a wash, and this works beautifully! In the photo below, I used the wash to color ribbon, watercolor paper, as well as acetate! Much to my pleasant surprise, the watered mousse dried beautifully on all the surfaces, even the acetate! I hope you will give this mousse a try -- it has tons of wonderful uses! High Tack Double-Sided Tape, 1/2"
High Tack Double-Sided Foam Mounting Tape, 1/2"
Happy Thursday! It's Carly and I'm here for another #throwbackthursdays, where we find inspiration in The CLASSroom archives! This week we are creating with Nuvo Embellishment Mousse by Tonic Studio and we're having tons of fun discovering "uses for mousses"! P.S. Ever need help choosing a layout for your card even after you've chosen a technique? I know I do! I always turn to my favorites from The CLASSroom. The layout of the card I made today was inspired by one of my all-time favs by Lisa, see it here. Hey there my #TexturalTuesdays friends! Such an exciting day here in the CLASSroom and we are about to get super texture-y! Yes, it IS a word. ;) I'm thrilled to be able to show how to use the Tonic Nuvo Embellishment Mousse as TEXTURE!! Yeah, baby...YEAHHHH!! First off, here's a look at my card. Gosh, I wish that shimmer and glitter showed up better. It is soooo pretty! First, I prepped my card by using Frog Tape so that I don't get the ink where I don't want it. This is a low-tack tape and I've never had any issues with it ripping my paper. Good stuff! While the mousse is still pliable, sprinkle glitter into areas that you wish to be enhanced. I also applied (carefully) the beautiful Pretty Pink Posh Sparkling Clear Confetti Mix by pressing them into them into the mousse. The mousse works much like as an adhesive in this way. This panel (which is the card base) was set aside to dry completely. A 1" x 5½" piece of Taylored Expressions Salt Water Taffy Cardstock was cut. And a strip of 1¼" x 5½" Taylored Expressions Blue Corn Cardstock was also cut. The Salt Water Taffy Cardstock was run through my Big Shot using the Embossing Folder Polka Dots from the Sizzix Eileen Hull, Textured Impressions Embossing Folders, Polka Dots & Starflowers Set. I used my fingers to dab into the mousse and lightly rub over the raised areas that the embossing folder left behind. It's very imperfect, but that's the beauty of mixed media. Next up, the embossed strip is adhered to the Blue Corn panel which is edged with more of the Tonic Nuvo Embellishment Mousse in Aquamarine. Twine is wrapped around this piece before it is adhered to the card base. Once adhered, then it's ready for me to tie into a pretty bow. The last thing I had to do for this card was die-cut the word "Hello" from Essentials by Ellen Designer Dies, Brushstroke Hello by Julie Ebersole. This was cut from the same Blue Corn cardstock and popped up with foam squares cut down accordingly. I hope the close-ups will help give you a better idea of how pretty this card turned out. Look at how dimensional the mousse is!! And the glitter?!! And the sequins?!!!! This is some serious texture, my friends. This pic caught the light so perfectly! You can really see the background, too. Even though it's not as shimmery the color is so pretty. Looks almost oceanic, doesn't it? You can use this mousse in SO many ways, as you'll be seeing all week long here in the CLASSroom. Make sure to treat yourself to a mousse or any other in-stock Tonic product while supplies last until April 30th, 11:59 PM, PDT. Today is the big day! We are excited to be part of this exciting event. We have partnered with 15 other stamp and papercraft companies to do a special blog hop and will be giving away 16 prizes to 16 lucky winners! Bonus entry: Share this post or any of the social media posts with #2017SFMS for an added entry to win the Lawn Fawn $30 online gift certificate. Now, on to the project I'm sharing today! This is my first time playing with Tonic's NUVO Embellishment Mousse--the pearlescent, shimmery medium comes in 24 shades. There are a variety of ways to apply/use Embellishment Mousse, but I'll be focusing on "direct to paper" for today's project. LINK: Watch in HD on our YouTube Channel HERE; thanks for giving us a thumbs' up and for subscribing to our channel! It retains the shape and dimension it is spread into and does not run or drip, unless thinned with water. It can be applied with fingertips, sponges, brushes, daubers, etc. It dries fairly quickly and once dry, is "fixed" to the paper and will not smear or smudge, transfer to fingertips, or reactivate when layering more mousse on top. It's translucent when thinly applied so other colors underneath can show through. If spread thinly, the surface will be smooth and flat, with a shimmery/pearlescent finish. When stamping over the dry mousse surface, an inked stamp can sometimes slide across the surface; consider using the MISTI for stamping to avoid slipping. Happy #TexturalTuesdays! It's Lisa and what a fun Tuesday it is! Paper Smooches is in the house. YAY!! I love Kim Hughes' quirky style and what I've seen other people do with these fun stamps. It was such a joy to be able to try my own hand at them for the VERY first time (other than just sentiments anyway). And while we're talking about Paper Smooches -- Did you know that the store is having a sale of 20% off this week (March 27 - April 1) on all in-stock Paper Smooches products while supplies last? I started by stamping my little chickadee in Versafine and then embossing it with clear embossing powder. I used a square Zig Zag Stitched Square STAX from MFT to die-cut the image prior to coloring. I wanted to do this to try to keep my coloring in perspective. I used three yellows to color the little chickadee. I think these three worked really well to give him (or her?) really good shading. I added some grey for grounding. Whether it was necessary or not, I'm not sure. But, it would have looked odd if the chickadee was just floating around on the blank card. Y'know? For some sky or background color I used B000 and B00 which was blended out. I then added some pretty shimmer to the chick using the Nuvo Aqua Shimmer Pen from Tonic. This pen is much like the Wink of Stella, but has less of a silver tone to it and comes in a pack of two (which I love!). The patterned paper I selected was adhered to the card base, the chickadee square was adhered in the area I thought would look best, and then I die cut my remaining pieces and parts. Now that I have my frame, I put that in my MISTI and selected my sentiment and some other small images to go around the frame. I'll color those in with my Copics and add some other embellishments after they're colored. I'll be using the Tonic Nuvo Crystal Drops and the Pretty Pink Posh Sequins, Sparkling Clear Confetti Mix as my finishing touches. Aren't they the coolest thing ever?!! I thought that the frame was too "white". Weird, huh? So I used a Zig Clean Color Real Brush Marker in Light Blue (036) to break up the white space. It's a bit hard to tell, but it works really well and makes ME much happier. :) The frame was popped up with adhesive squares when all the embellishments are dry. Here's a slightly different view of the card. I hope you like it and get out your Paper Smooches stamps!! Happy Thursday! It's Carly and I'm here for another #throwbackthursdays, where we find inspiration in The CLASSroom archives! This week in addition to learning from past posts by our fabulous team, we are all experimenting with Chibitronics Chibi Lights. To create this card, start by creating the frame and background. For the background I used a piece of glassine and added some Nuvo Mousse in an abstract pattern. If you haven't tried the mousse yet, it's awesome. It has a great metallic and slightly dimensional finish. And the mousse did wrinkle my glassine slightly but that was perfect for my "frozen" card. Next die cut the Happy Card. This die is so fun, it's a frame with different pieces you can insert like the flowers I used and words like happy, kind and love. To the floral frame, add a little Nuvo Glimmer Paste. I placed my frame over my glassine before adding the paste so it would be applied to both surfaces and leave a pattern on the glassine. Next plan the placement of the light and circuit. I positioned my light in the center of my flower and ran the copper tape through two slits in the panel to create the circuit on the back so they wouldn't be visible under the glassine. To create the switch I made a battery holder placing double sided foam tape around the battery and a piece of card stock to cover it. When the battery is pressed the positive and negative leads of copper tape touch the corresponding sides of the battery and the light is illuminated. It's a messy circuit but effective. Once the circuit has been created, adhere the frame & glassine over the lit panel and then all of it onto an A2 card. So fun right?! You must try it for yourself and a little bird told me that this is the week to do it, Chibi Lights are on special. Hi Friends! It's Carly and I'm here for another #throwbackthursdays, where we find inspiration in The CLASSroom archives! Today I'm excited to share a card with the Nuvo Crystal Drops by Tonic Studio! I've been hearing awesome things about the Nuvo drops...they have great colors, great dimension, are super versatile and easy to work with...and I definitely found all of those things to be true! If you have worked with Liquid Pearls by Ranger, Nuvo is a similar product but I personally found creating symmetrical dots was much easier with the Nuvo, practically impossible to mess up actually (and I have very shakey hands, LOL)! I did a little test with similar shades of Stickles, Nuvo and Liquid Pearls. I found that when using the same pressure and applying the same amount to cardstock, the Nuvo stayed the most round and self-flattened on top perfectly. The Stickles spread & retained the least amount of dimension. And the Liquid Pearls dried with their little pointy, peaks. To create this card, stamp the strings of lights in a repeating pattern. I used the MISTI and only inked the right side of the stamp to create my pattern. Use a black pen to connect any light strands the stamp missed. Stamp the houses along the bottom in a repeating pattern. Add color to the houses with Clean Color markers. Use the Nuvo Drops to add color to the strands of Christmas lights. A little tip, practice squeezing drops of the Nuvo onto scratch paper before adding to your card, just to get a feel for the amount of pressure needed. I love the dimension and color the Nuvo Drops add! Thanks for stopping by and have a great day! And Happy Thanksgiving! Essentials by Ellen, Julie's Smooth Bristol, 20pc-5.5" x 5.5"